Ziindi | An independent zine featuring modern Indigenous art. We are proud to partner with Jeffrey Lazos-Fern, along with a team of phenomenal artists, chef, performers, and visionaries to bring you THE EDIBLE DESERT EXPERIENCE! Tickets won’t last – get yours today !! This OUTDOOR dining experience is enhanced by environmentally-themed tables and atmosphere created by Mia Benzoni and Jeffrey Lazos-Ferns, inspired by the landscapes, colors, and sounds of the desert. 1Spot Gallery and the Drive-Thru Gallery & Studio will be open for viewing, and artists include ballet dancer/choreographer Michelle Ceballos-Michot, a hilarious and radical sketch theater performance by El Chupacabrones, the art/body painting of Brandon McGill, live classical piano/cello by Michael Wordlaw and special guest Twix Two-Spirit Apache sharing traditional arts/crafts/words/ and edible, medicinal plants of his culture. Twix a Two-Spirit Apache who will be sharing at the Edible Desert Experience traditional crafts, stories with us. FIRST FRI RECAP : FULL HOUSE @ 1SPOT : HEAT CAN’T STOP US! WOW – THANK YOU PHOENIX! We were packed to the rim with art-loving folks, friends, and family! 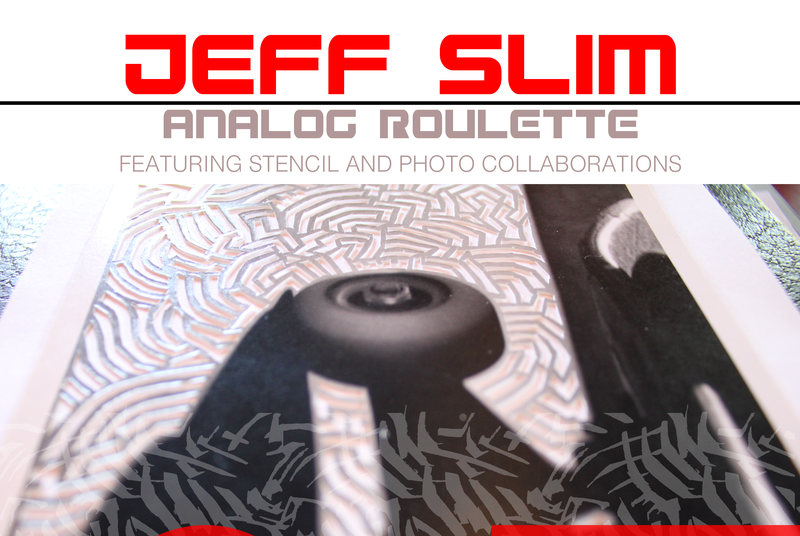 Jeff Slim’s “Analog Roulette” was a great success, and Ryan Dennison‘s ethereal musical set was beautiful! Our wonderful neighbor Andrew Pielage and his Drive-Thru Gallery had a great Haboob show that was spectacular too!